A central processing unit built into a single VLSI chip is called a microprocessor. It is a general purpose device and an additional outside circuitry is added to make it work as a microcomputer. Operations performed by microprocessor are adding, subtracting, comparing two numbers and fetching the data from memory for transferring it from one place to another. Microprocessors is also called as Basic Input-Output system (BIOS) which used for processing the input received from sensors and produced the equivalent output from the system. 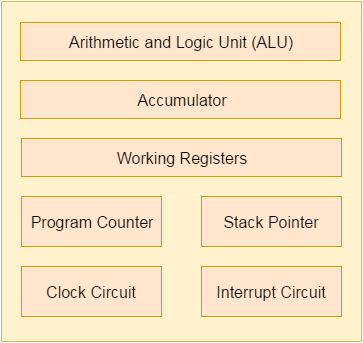 Arithmetic and Logic unit (ALU): ALU inside a microprocessor used to perform the arithmetic and logic operation. It performs the logic operation on the data stored inside a register. Accumulator: It is a register inside which the intermediate arithmetic and logical operation data is stored. Working registers: It is a storage device used to store the data inside a microprocessor in different address location. Program counter: It is used for counting the number of program executed inside a microprocessor. Stack pointer: Stack pointer act as a pointer to the certain address. It is a register used to store the address of the last program request made by the processor inside a stack. Clock circuit: It is used for generate the clock pulse required as a reference signal for the microprocessor. Interrupt circuit: It is used for generating the interrupt signal when the higher priority process required to be served first on basis of priority by microprocessor.